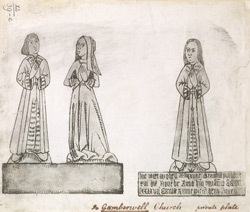 Drawing of figures from brass monuments found in St Giles, the medieval parish church of Camberwell, which used to serve a number of villages including Camberwell, Peckham and Dulwich. It was mostly destroyed in a fire in 1841 and rebuilt by Scott and Moffatt. There are several brasses of kneeling couples in the church.